If you are heading out on the water, one essential survival supply is a handheld VHF radio. A VHF radio makes it possible to contact the Coast Guard as well as other vessels while you are at sea. This may be the only way you can receive help if you should experience an emergency away from shore, outside the range of cell phones and other communication devices. As the name implies, handheld VHF radios can be carried by hand, and can operate on their own power. There are also fixed mount models. Ideally, you should purchase both. Want to purchase a portable VHF radio, but not sure where to start? Check the table below for the best handheld VHF radios. If you still are not sure what you need, read on to learn all about important features to look for and questions to ask while you are shopping for handheld VHF radios. What is a Handheld VHF Radio? A handheld VHF radio is a portable VHF radio. The VHF range is inclusive between 156.0 and 174 MHz. The letters VHF stand for “very high frequency.” VHF radios are used for marine communication, and are installed on both large and small vessels. With a VHF radio, it is possible to call the Coast Guard for rescue. A handheld VHF radio also is useful for communicating with marinas and harbors as well as the operators of bridges and locks. While VHF radios do require line of sight in order to send and receive clear transmissions, this tends not to be problematic at sea as few obstacles are likely to stand in the way. Note however that in crowded areas, stronger signals override weaker ones, so it may be important to shop for a radio with high wattage and a longer antenna. Is a License Needed for a Handheld VHF Radio? Thankfully in most cases, a license is not necessary in order to own and use a handheld VHF radio. The exception is if you are operating a commercial or international vessel. Also note that if the radio you are purchasing includes DSC capability, then you will need to obtain a 9-digit number known as a “maritime mobile service identity (MMSI)” number and register it with the Coast Guard. The features you need will depend in part on where you intend to use the handheld VHF radio. If you will be staying close to shore, you might get away with a lower battery life in exchange for higher buoyancy (more on that shortly). A shorter transmission range may be acceptable as well. But if you will be sailing out further away from shore, a longer battery life and a higher range may be vital. What kind of charging options do you need? If you purchase a model which has rechargeable batteries, be sure to check the compatibility of the docking station to see what you can plug it into. Make sure that you can actually recharge it from your ship’s power. Most handheld VHF radios allow you to transmit on up to around 6 watts. Ideally, you should look for a model which provides you with multiple settings. That way, you can transmit on a lower wattage when you want to conserve power, then boost it only when you need to extend your range. Suppose you accidentally drop your VHF radio overboard—or fall overboard while it is in your hand? In a handheld VHF radio, it is important to look for waterproofing. Make sure that the radio is more than just water resistant. The best ratings are IPX7 and IPX8, which provide waterproofing in up to three feet of water or more than three feet of water respectively. Also shop for a radio which is buoyant. That means if you drop it in the water, it will float on the surface so that you can find it again. This could easily be a life-saving feature. The tradeoff with a buoyant radio is that it is small and lightweight, and as a result can only fit smaller batteries with a shorter life. Larger models can fit bigger batteries which provide power for longer before they require recharging or replacement. You will need to decide based on your needs whether it is more important to have a buoyant radio or one with the longest possible battery life. DSC is short for “Digital Selective Calling.” This is a feature which is present in all fixed-mount VHF radios manufactured since 1999, but it is not present in every VHF handheld model. What is DSC? It is a feature which allows you to contact the Cost Guard with a distress signal. All you have to do is push a single button to transmit your call. If your radio incorporates GPS or is hooked up to GPS, your location is transmitted along with your distress signal. Nowadays, it is possible to buy a handheld VHF radio which includes internal GPS. As just discussed, this feature can integrate nicely with DSC to bring rescue teams directly to your location in case of an emergency. There are also other valuable uses for GPS as well. It can be used to see your exact map coordinates at any time. You also can create waypoints to help you keep track of where you have been. This is a particularly great feature if you are a fisherman or a scuba diver. When it comes to scanning, both Dual Watch and Tri Watch are useful features in handheld VHF radios. If a radio has Dual Watch, it is possible to monitor a priority channel as well as a secondary channel simultaneously. If Tri Watch is included, then the radio can be used to actively monitor three channels at the same time. These include the priority channel, channel 09, and any third channel you wish to watch. Some radios even include Quad Watch, which lets you monitor four channels at the same time. Look for a radio which includes alerts and updates from the National Oceanic and Atmospheric Administration (NOAA). This is a nationwide service which warns of inclement weather. Also useful are Specific Area Message Encoding (SAME) alerts. NOAA operates at a national level, whereas SAME alerts provide you with regional updates. Finally, being able to hear and transmit clearly over your marine VHF handheld radio could mean the difference between life and death. There are a lot of loud noises at seas. The roar of the ocean and the wind can be deafening. Add rain, crashing waves, and shipboard noises to the mix, and you need a radio which can cut through background noise and isolate speech. That is what active noise cancellation makes possible. You now know the most important features in VHF handheld radios. Scroll back up to the chart at the top of this page for a quick comparison of some of the best VHF handheld radios on the market today, or continue reading for detailed reviews. Uniden has a reputation for making tough, reliable marine electronics products. The MHS75 phone itself is another example of Uniden’s outstanding craftsmanship. This radio’s “Triple Watch” scanner provides an innovative way to monitor several signals at once. However, this phone’s flimsy plastic accessories don’t live up to the Uniden brand name. Long battery life. A single charge will last you two or three days. Uniden quality. The radio won’t bust apart if you drop it on the ground. Comes with a charger. If your boat has a cigarette style 12 volt charger, you can use it to charge the phone as you navigate. Helps you steer clear of storms. This radio sounds an alert tone when NOAA issues a severe weather warning. Innovative scanning function frees up your hands. The MHS75’s “Triple Watch” feature prevents you from having to fiddle with your radio while you’re piloting your boat. It monitors two different signals while you listen to whatever broadcast you want. Waterproof & submersible. The MHS75 floats, so it’s easy to get it back if it falls out of the boat. It’s also JIS8 certified, which means that it can survive being submerged in 5 feet of water for up to 30 minutes. Good performance. This 5 watt radio performs well inside its somewhat limited 12 mile range. The radio itself can definitely weather a storm. However, the plastic clips that hold the radio in place are not very sturdy. Other two-way marine radios have better range. This popular handheld model of VHF marine radio features a large LCD screen measuring 1.75” and transmits on up to 5 watts of power. It offers a range of around 5 miles on open water. Power options. Power options between 1-5 watts are available. That means that you can reduce the wattage when you want to save your battery. If you need to boost your range, you can increase the wattage and send your transmissions further. Dual/Tri Watch. Both Dual and Tri Watch are included, so you can monitor multiple channels simultaneously. USB charger. The radio includes a USB cord which you can use to plug it in and charge it. You do not need a dedicated charger. Any mini USB charger will do the trick. Lightweight and compact. 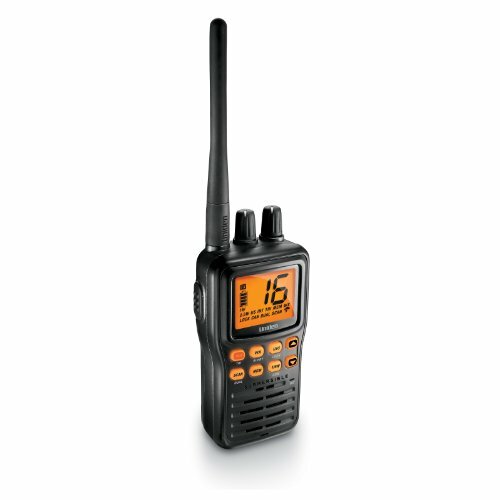 This VHF handheld radio features a design which is lightweight and fits easily in your hand. This makes it easier to hold onto, and enables it to float (see below). Waterproof and floats. This feature is not emphasized by the seller, but it is mentioned by purchasers. The radio is buoyant and waterproof, so you should be able to retrieve it if you drop it in the water. No speaker microphone available. There is no way to pair a speaker microphone with this radio. The wrist strap is short. This can make it hard/awkward to reach the buttons while using the strap. DSC is missing. This radio does not include DSC, so if you need that feature, another radio may be a more suitable purchase. ICOM M36 VHF radio tends to sell at a higher price than some of the others on this list, but it includes a number of great features. As of the time of this review, it has also received some excellent feedback online. Waterproof with IPX7 rating. This means that the radio can be submerged in up to three feet of water without dying. Dual and Tri Watch. Monitor two or three channels at a time. Battery life indicator. There is a four-step indicator which shows you your battery level. That way you know exactly how soon you need to recharge. 2-step power saving feature. If you want to conserve battery life, you can use this special feature to do so. Weather alerts. The weather alert feature warns you if inclement conditions are on their way. Noise cancellation. True noise canceling keeps your outgoing signals clear. Output up to 6 watts. Many VHF handheld radios only provide up to 5 watts of power, but this one can operate on 6 watts. This can extend your range. Higher price. The ICOM M36 Vhf-HH marine radio is more expensive than some other models we have reviewed. Not as much feedback yet. For whatever reason, as of the time of this review, there is not a lot of customer feedback on this radio, so that gives you less information from a buyer standpoint. 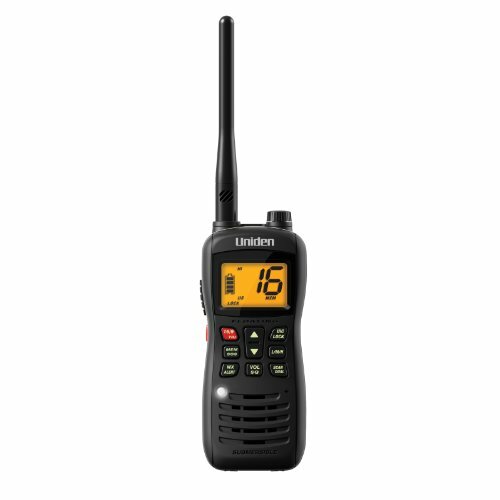 Another reasonably priced option from a major brand is the Uniden MHS126 VHF handheld radio. As the name indicates, it is waterproof, and also designed to float. It boasts a large LCD screen which is easy to read. Submersible and can float. This radio has the J1S8 rating, which means that it is submersible. It is also designed to be buoyant so that you can retrieve it. Dual and Tri Watch. You can monitor two or three channels using the Dual or Tri Watch features. Transmit and receive on a wide range of channels. Not only does this radio provide you with access to all USA channels, but it also includes all Canadian and International marine channels as well. Emergency strobe. An emergency strobe allows you to send a visual signal of your position to rescue workers nearby. All weather channels. All NOAA channels are included in this radio, and you can receive automatic alerts if inclement conditions are on their way. Instant channel 9 or 16. In an emergency, the radio provides instant access to channels 9 and 16. There may be some battery issues. The latch which holds the battery is weak, and may snap. In some cases, the batteries may also lose their charge within a year. Replacement batteries are not easy to come by. Eat Like a Caveman Tacos!